Thank you so much for joining me today! I have a really fun project to share with you. I just love making paper flowers. I made this project in early fall/late spring. I had a thing for making flowers, I would make them and let them sit on my desk. That was until the day I found this great frame at Target. The green box/frame was in the home decor area on clearance. It was meant to stand up like this or be hung on the wall, it had a nice saying on the inside that I covered with the Presto Patterns DSP. I inked the paper with a sponge and Crumb Cake, then sponged the edges with Early Espresso. 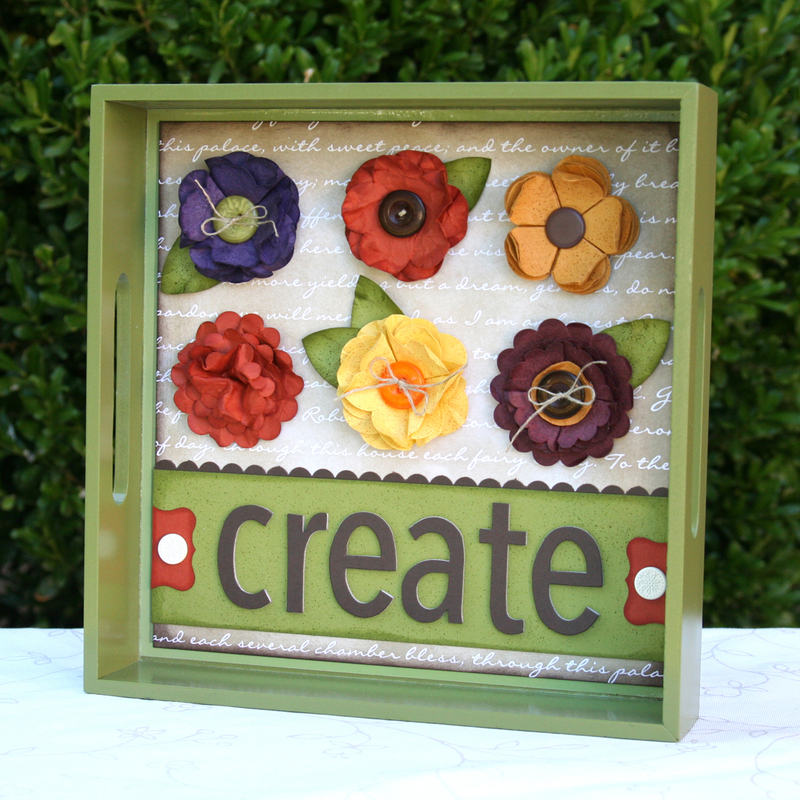 The flowers are made using the Scallop Circle Punches (both sizes) and the XL Fancy Flower Punch. Each peice of cardstock was crumbled and color spritzed with the coordinating marker. Here are the colors listed left to right starting on the top row: Elegant Eggplant, Cajun Craze, More Mustard, Cajun Craze, Daffodil Delight and Bravo Burgundy. The leaves are made with the wide oval punch, punching each leaf twice in Old Olive and the have various centers. I hope you enjoy this project as much as I do. How to make each of these flowers (plus some) will be taught in my Paper Flowers Class. Check the Classes page for details. I offer kits by mail for anyone that cannot attend.